quanto costa il levitra originale in farmacia I have been an avid fan of crystals and geodes since I was in grade five and my parents took me to a lapidary shop. At the shop, they sold uncut geodes that were simply fascinating to me- unleashed potential that held who-knows-what-sort of stones and crystals. I begged them for an uncut one and they happily purchased one for me. As I watched the shop expert slice through the middle, I don’t remember blinking. In a few minute’s time, but what seemed like forever to me then, the geode was sliced perfectly in half and was handed to me to survey. Tiny purple quartz stones glistened in the shop light, and they looked priceless. It was unfathomable to me that a plain, round stone could hold such beauty. We purchased carved, wooden stands to hold my beauties and they have traveled with me to each new house through the years. prescription water pills lasix Fast forward to Mid-June of this year. When I found out during a visit to Put-in-Bay that Heineman’s Winery had http://maientertainmentlaw.com/?search=can-levitra-tablets-cause-heart-attack Crystal Cave-the world’s largest geode, I gave up the chance to go kayaking and instead wanted to visit this cave of wonders. Crystal Cave was discovered by well diggers in 1897 looking for a water source to use at the winery. The cave and its tours saved Heineman’s from bankruptcy during prohibition and selling of celestite crystals for use in fireworks has given the winery extra income as well. A dream come true? I do believe so! A steep staircase descends into the geode and once inside, the beautiful light blue stones were mesmerizing to me. 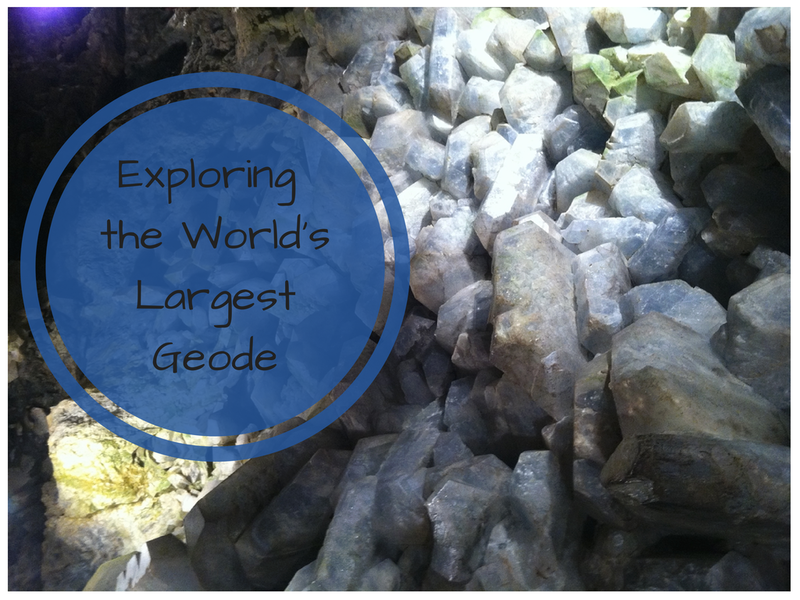 I, along with 20 or so others, was inside a geode. Celestite is not only used for fireworks, but is thought to have metaphysical healing properties by new-age thinkers. The largest crystal in Crystal Cave, 18 inches wide and estimated to weigh 300 pounds, has been preserved by the winery. During our tour, a piece of celestite was passed around. Although the stone looked light, it was surprisingly heavy, as celestite is a compact mineral. Don’t worry, this little guy is of the fabric variety. Tours of both the cave and winery are available every day from early May through late September, and the cost is $7 for adults and $3 for children aged 6 to 11. The fee also includes a quick tour of the winery and a taste test of one of their wines. Tours start at 11am, except for Sundays when the tours start at noon. And now for the technical stuff: I was given complimentary admission to Crystal Cave to give you fine folks the scoop on it and my own opinion. I had a blast during my visit and seriously would have paid the seven bucks myself to visit. Happy 200th Birthday, Star-Spangled Banner! miglior sito per acquistare viagra generico a Torino Sign me up for the newsletter!